In 2017, the music world lost one of its most iconic singer-songwriters when Tom Petty passed away. To honor the legendary Tom Petty, the Houston Symphony is performing a night of Petty’s music featuring vocalist Tony Vincent. This is sure to be a unique night of music that will please fans of both Tom Petty and the Houston Symphony. Best of all? The concert will be performed outside under the stars at the stunning Cynthia Woods Mitchell Pavilion. Don’t miss it! Tom Petty’s career spanned four decades and today Petty ranks as one of the best-selling musicians of all time with more than 80 million records sold worldwide. Petty is best known for hits like “Won’t Back Down” and “Mary Jane’s Last Dance” from his work with his band Tom Petty and the Heartbreakers but also achieved success with the 1980s supergroup The Traveling Wilburys alongside Bob Dylan, George Harrison, Roy Orbison, and Jeff Lynne. The Houston Symphony will perform a night of Petty’s classic rock hits alongside all-star Broadway vocalist Tony Vincent and a band of talented musicians who will bring Petty’s catalog to life. Petty’s music was arranged for the symphony orchestra by conductor/arranger Brent Havens. The show is family-friendly and is sure to please guests of all ages. Reserved seats start at only $20, and there is free seating available in the mezzanine and on the lawn. 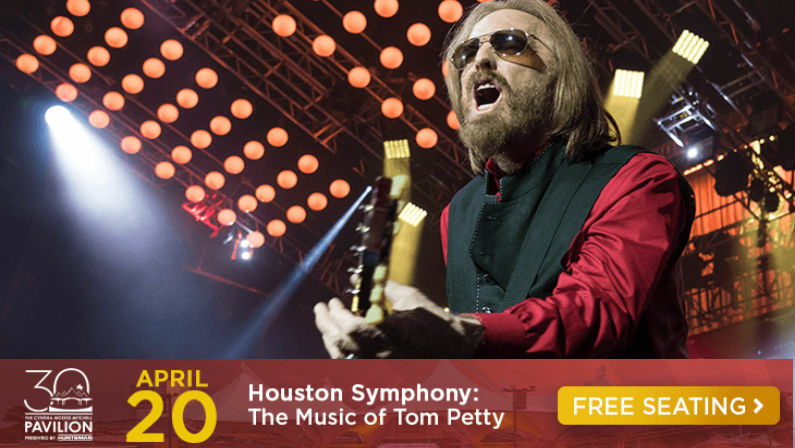 The Houston Symphony’s “The Music of Tom Petty” will be performed on Saturday, April 20 at 8:00 pm at The Cynthia Woods Mitchell Pavilion, 2005 Lake Robbins Drive, The Woodlands, TX, 77380. Gates open at 7:00 pm. For more information visit the event’s official website or Facebook event page.